Saving money on your wedding venue doesn’t mean you have to sacrifice quality and style. Check out some of coolest and reasonably priced venues in North Texas! Planning the wedding of your dreams in Dallas-Fort Worth doesn’t have to mean racking up an impossibly expensive tab. Many of the best spaces in the area are also affordable wedding venues in DFW with reception fees starting under $1,500 — well below average for the region. 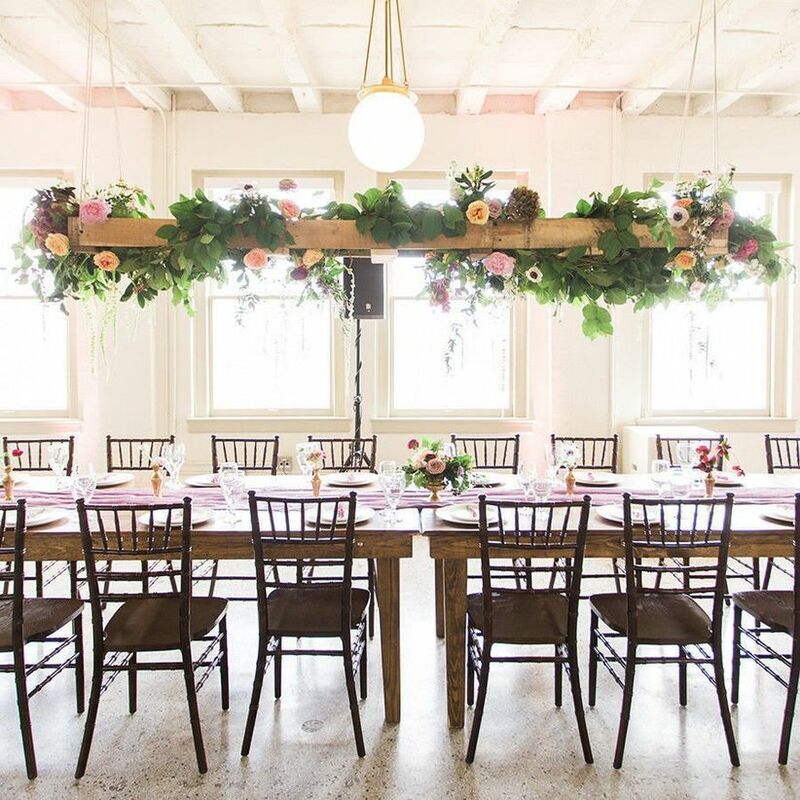 Your venue costs (along with catering, cake and rentals, like table linens) will constiute the biggest chunk of your wedding budget at about 50 percent, so selecting a cost-efficient wedding venue goes a long way to being sure you don’t go over budget. If you’re worried about sacrificing quality, don’t! Inexpensive wedding venues in Dallas, Fort Worth and the surrounding areas are a collection of properties that offer lots of value for the price and tons of perfectly on-trend assets. See our favorite affordable wedding venues in DFW! Proud Fort Worthians will look no further for economical Fort Worth wedding venues than Stockyards Station, in the heart of the Stockyards National Historic District. Half quirky shrine to Cowtown’s past as a famed stop for cattle drivers headed west, half cultural epicenter filled with food, art and entertainment, the Stockyards hold a special place in the heart of every cowgirl or cowboy. 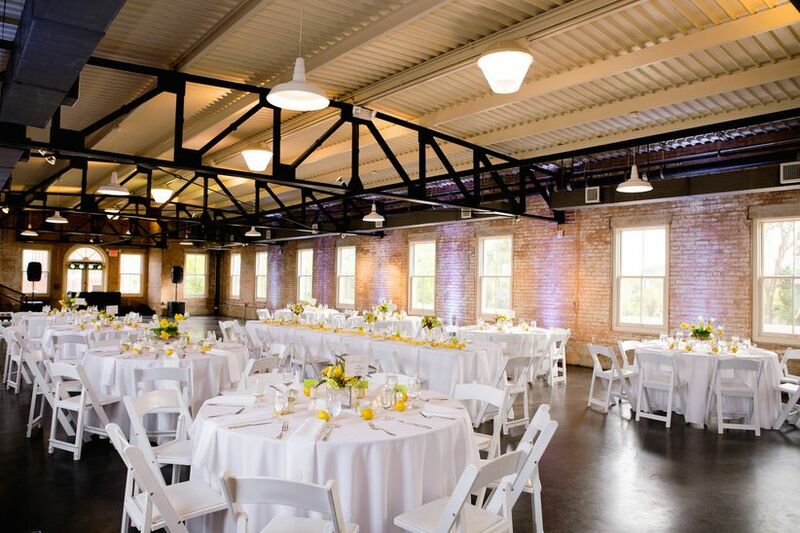 Whether you’re planning on going total rustic with hay bales and Western boots, or you’re leaning toward industrial chic, Stockyards Station is the perfect backdrop for your wedding vision. The four event spaces of this North Texas venue accommodate up to 450 wedding guests and all feature authentic rodeo-esque details like wood columns, brick floors and high ceilings. 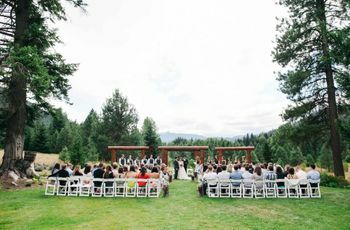 Best of all, site fees for both a ceremony or a reception start at $500, regardless of the season. Fees include tables, linens and chairs as well as set-up, cleanup and parking. 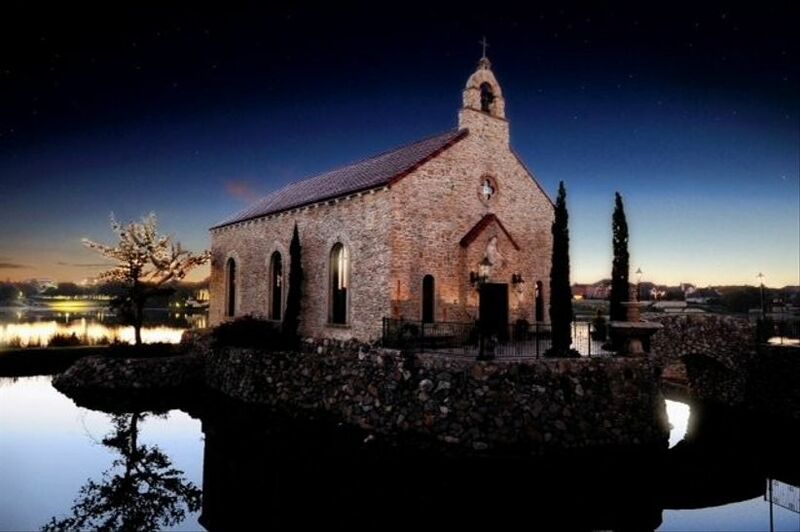 This Romanesque style chapel wedding venue in McKinney is decidedly less expensive than lugging your wedding party and guests to a remote village in Italy and maaaaybe, just a little bit cooler too. As Dallas wedding venues go, Bella Donna Chapel is definitely unique. Set up on one of two islands in the Harbor of the Adriatica Village, it’s the perfect setting for a Dallas wedding straight out of 18th century Europe. The chapel is made of stone, inspired by Italian village churches and the only path to enter is by footbridge, so a memorable entrance and lasting impression for your guests is guaranteed. The remote Italian ambiance of Bella Donna continues once you step inside and get a load of the domed fresco painted ceiling, antique pews and slabs of ancient limestone carvings salvaged from Tuscany that adorn the chapel. 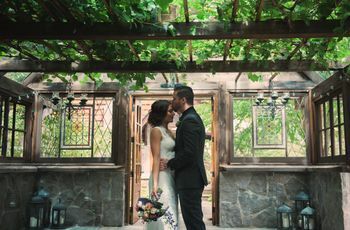 Hardly the wedding location for the couple who isn’t looking to make a splash, this chapel is also filled with sultry colors thanks to intricate chandeliers, large stained glass windows and a patterned tile floor. Bella Donna seats up to 185 guests and reception site fees start at $1,500. Site fees include chairs and parking. Nature lovers rejoice! 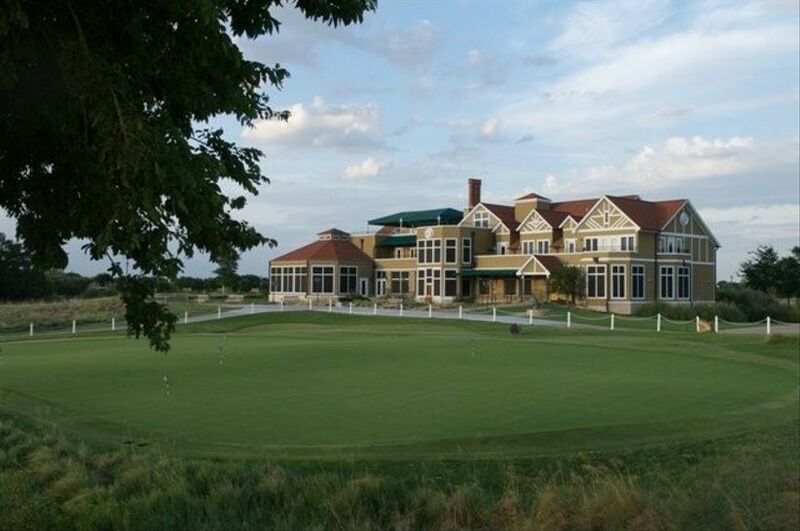 The Filter Building is a stunning gem of an outdoor wedding venue located on White Rock Lake. Couples may choose to be wed directly on the waterfront, like Heather and Kristy did for their sunshine-inspired spring wedding, then head indoors where the sparse, converted industrial building can be transformed into the wedding reception of your dreams. This Dallas venue is awash in natural light from floor to ceiling windows and full of character in the form of exposed brick walls and low beam ceilings. The Filter Building is also one of the most affordable wedding venues in DFW with ceremony and reception site fees both starting at $1,000, regardless of the season. The fees include a bridal suite along with tables, chairs and parking. 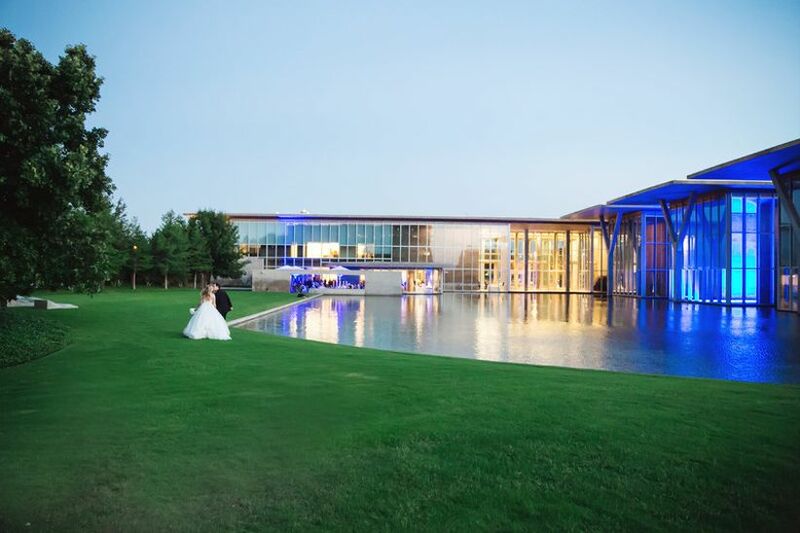 For Texas weddings that call for just the right mix country and classy, The Tribute at the Colony is a 7,500 square feet of perfectly manicured grounds on the Lewisville Lake, about 30 miles north of Dallas. 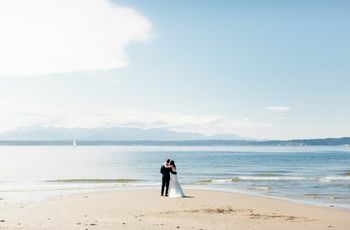 This inexpensive wedding venue offers value that belies the relatively small price tag with opportunities to offer fun guest experiences both indoors and outdoors. The grounds are perfect for lakefront photo opportunities or a romantic ceremony with the classic gazebo serving as the ceremony structure. There’s also a covered outdoor space for wedding receptions best kept under the Texas sky. Indoors, enjoy the Royal Ballroom, which accommodates up to 200 guests in a chic, classic setting. 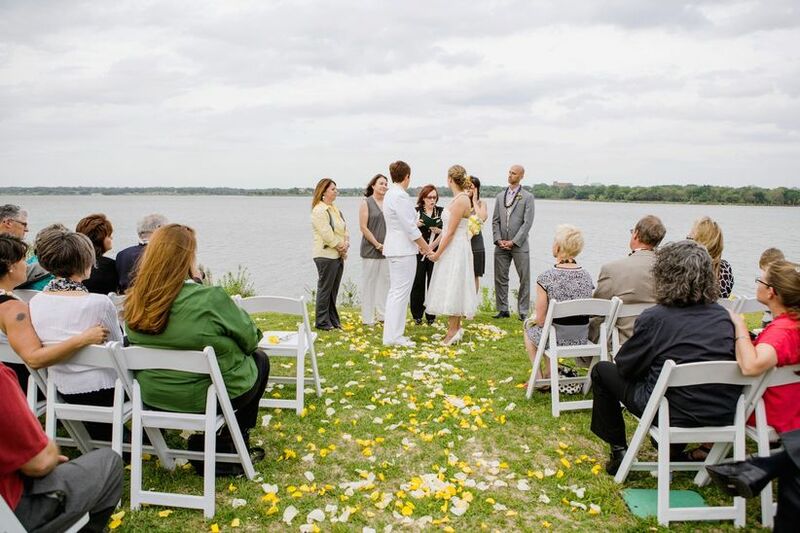 Ceremony site fees are $1,500 during peak season, which is April, May, September and October, and $750 off-peak season. Reception site fees start at $1,000 during peak season and $500 off peak. 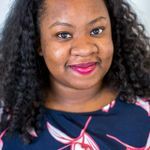 Fees include a bridal suite for getting ready; chairs, linens, china, flatware and glassware during the reception along with set up, clean up, parking and event planning. Take a peek into turn of the 20th century Fort Worth with this artfully restored wedding venue, right near the city’s center. Thistle Hill House was built more than 100 years ago in the Georgian Revival style with an elegant veranda, Roman columns and an expansive lawn for outdoor ceremonies. 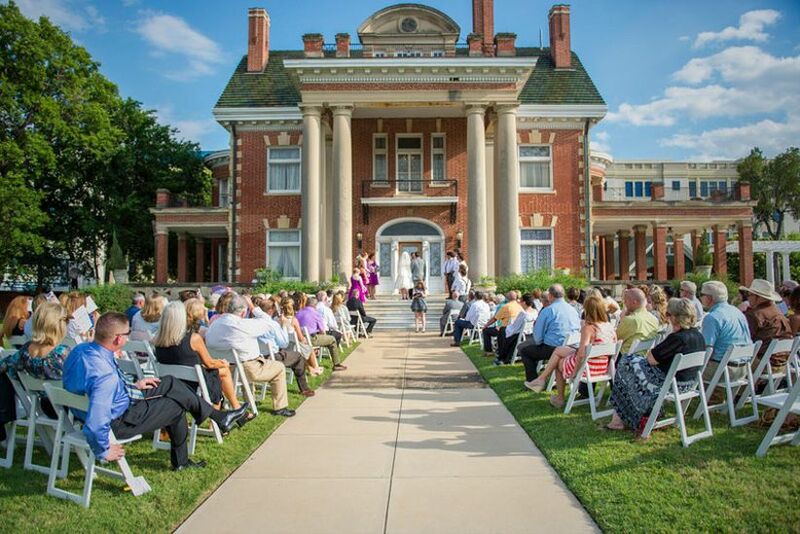 Though its day job is to serve as a museum about the early days of North Texas, Thistle Hill moonlights as a beautiful historic home wedding venue with the capacity for up to 250 guests to roam its 11,000 square feet grounds. 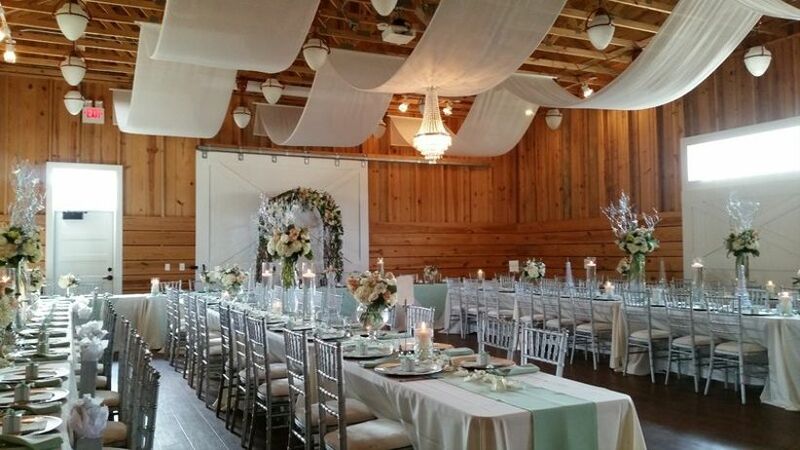 Regardless of season, ceremony site fees and reception site fees start at $1,450 for this economical wedding venue. Fees include use of a bridal suite and chairs. Museum wedding venues aren’t known for being the most inexpensive, but the Modern Museum of Fort Worth’s reception site fees start at just $500. Fees include set up and clean up along with tables, chairs, linens, china, flatware, glassware and parking. Part of Fort Worth’s Cultural District, the Modern is an all-glass building with two distinct event spaces, the largest of which holds up to 500 guests. The sparse stylings are perfect for couples looking for a neutral and modern wedding palette. 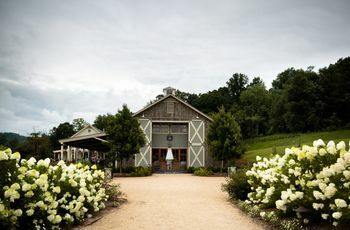 The very definition of elevated rustic, Frisco Heritage Center is a sprawling property with a cluster of wedding venues, including a classic white wedding chapel and a revitalized railway depot. Located about 30 miles north of Dallas in the town of Frisco, the center was originally designed to honor the unique history of the city. Among the many photogenic sights for couples are a vintage oil derrick and a gazebo. With ceremony and reception site fees starting at $1,000 for all seasons, Frisco Heritage Center is also a very affordable wedding venue for DFW couples.